Venue: 3F, Silky Hall at Silky Building in front of the Suzaka Station of Nagano Electric Railways. You can enjoy wines on board, songs, Photographing with “Hy brikko chan”, a female train character famous from Koumi Line Electric Railways. Silky Hall is just a minute walk away from the exit of the Suzaka Station of Nagano Electric Railways(Nagaden). The Suzaka Station is reached by 25 minute train ride from Nagano Station. From Tokyo: Take Shinkansen (90 minuets) to Nagano and transfer to Nagaden. Day One: Take Shinkansen to Nagano. 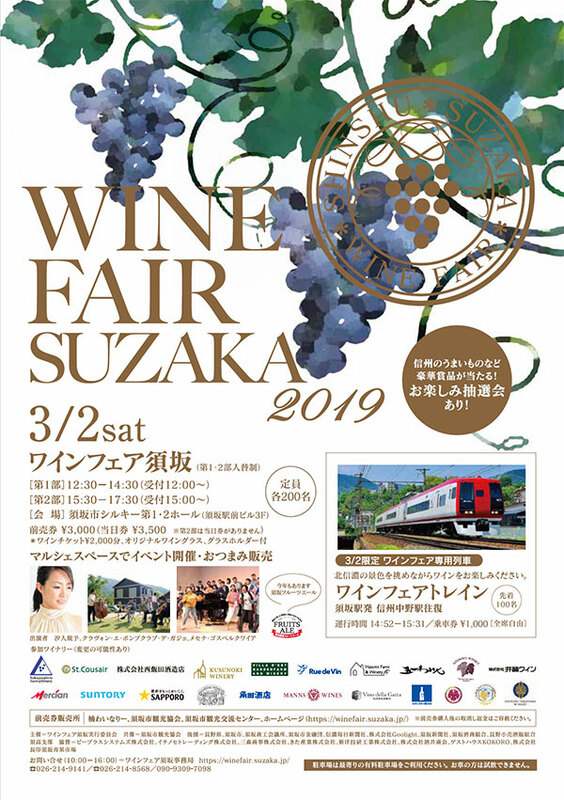 Come and join Wine Fair Suzaka. Enjoy Nagano wines. Stay at Suzaka Onsen Kojoso, an onsen inn in Suzaka or at Guest House Kura, a B&B in Suzaka. Day Two: Take Nagaden to Yudanaka, the terminal. Then go to Wild Monkey Park to watch “SNOW MONKEYS”! Enjoy local buckwheat noodle (Soba) and return to Tokyo.